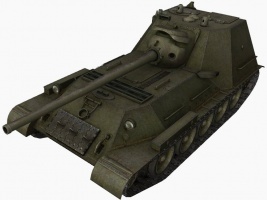 The SU-100M1 is a Soviet tier 7 tank destroyer. Desarrollado en 1944 en la Planta de Maquinaria Pesada Uralmash sobre la base del T-34-85. El compartimento del motor fue colocado en la parte frontal del chasis, y el compartimento de combate en la retaguardia, lo que proporcionaba protección adicional a la tripulación y reducía considerablemente el volumen por debajo del chasis. Aunque el SU-100M1 no se fabricó nunca, fue una etapa intermitente en el desarrollo del SU-100 y el SU-101, que ambos existieron en la realidad. With its small silhouette, good mobility, and great camouflage for its tier, this tank could be one of the best sniper TD's of its tier. 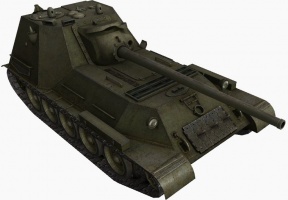 Though most players would go with the derp gun of the SU-152, the SU-100M1 would surprise you with its survivability even in close to mid range fights. Its armor can bounce shots from tanks even up to tier 9 if angled correctly as its frontal armor is very sloped. Its structure is very similar to the Jagdpanther II or the Ferdinand, thus making its side and most especially rear armor very low, so always keep this tank facing front. 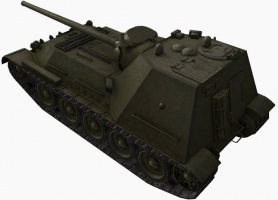 Once fully upgraded, the SU-100M1 can relocate quickly, shoot higher tiers' weak spots and can support fights very quickly. The SU-100M1 leads to the SU-101. Front armor can bounce some shots, especially from lower tiers. Cheap ammunition for both guns. The SU-100M1 plays like a turret-less T-44 in many, many ways and is quick and agile enough to wolf-pack with mediums. 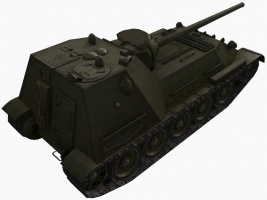 Its gun has fairly weak penetration for a Tier 7 Tank Destroyer, but the tank is maneuverable enough to flank and has great accuracy and aim time to hit the opponent's weak points. The gun does not disperse much even while moving, so it can take some shots on the move. The armor can bounce some shots, primarily from opponents below your tier, but with luck you can occasionally bounce even Tier 8 shots. As an aside, this tanks excellent maneuverability makes it more resistant to getting pinned by mediums than your average Tank Destroyer; as such it is safer to play a bit more aggressively. The V-2-34M Engine and 9RM Radio carry over from the SU-100. Research the 100 mm LB-1C Gun and the V-54K Engine in whichever order you wish. Finally, research the SU-100M1B Suspension. SU-101 Tank Destroyer at battlefield.ru. SU-100 Tank Destroyer at battlefield.ru.